If someone told me of a remote island where steam rose out of fields, where you could hike through snow and ice and then jump into a hot spring, where waves crash powerfully into black sand beaches, where active volcanoes simmer, where you can see the new earth created by the separation of tectonic plates and where multi-coloured lights dance across a star-filled sky, I would have figured it was the overactive imagination of a script writer. Yet that’s where I spent the last week – Iceland. I was fortunate enough to see the Northern Lights dancing across the sky on the evening of my first full day in Iceland, from the comfort of my rented accommodation. The Northern Lights, as seen just after sunset from the decking of the house I stayed at. 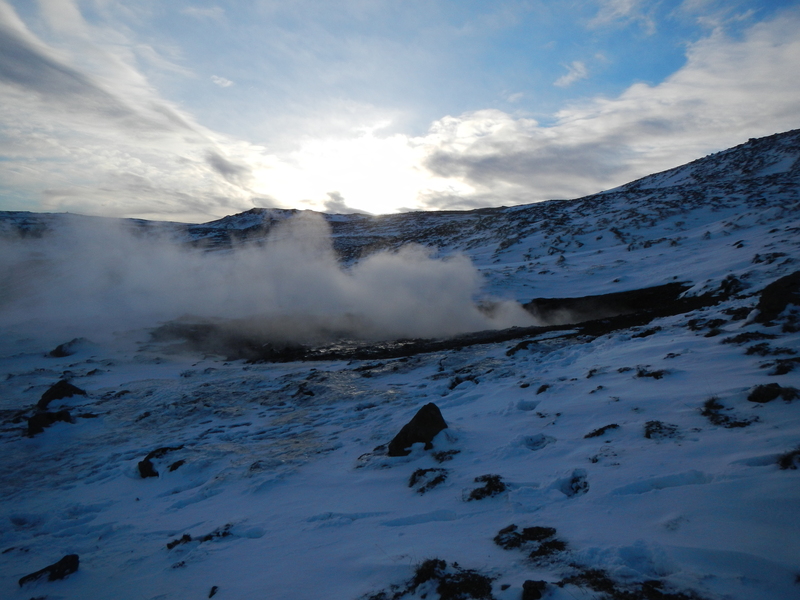 I spent the first full day checking out the usual tourist attractions including Gullfoss and Geysir. Gullfoss is home to a fantastic two stage waterfall. 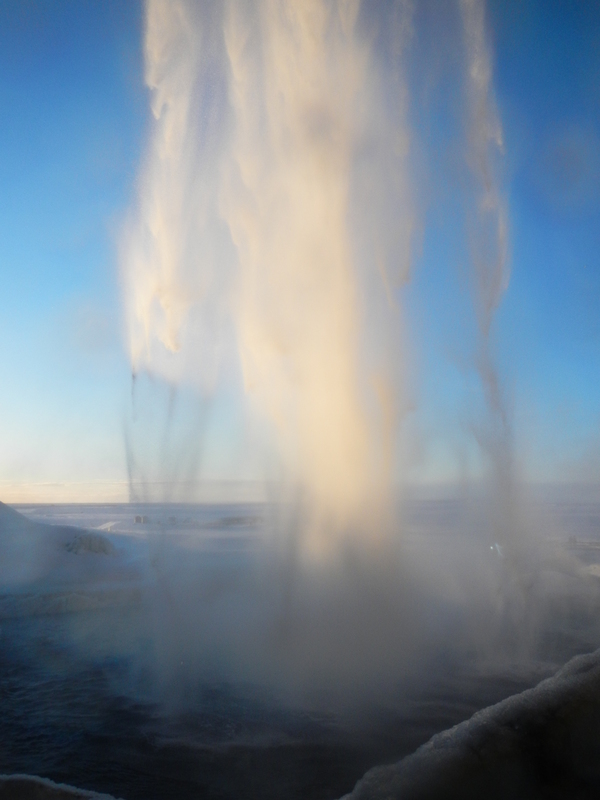 Geysir is home to the geyser which all other geysers are named. Impressive sights, but lacking the surprise element when you have to drive to within a five minute stroll of them. 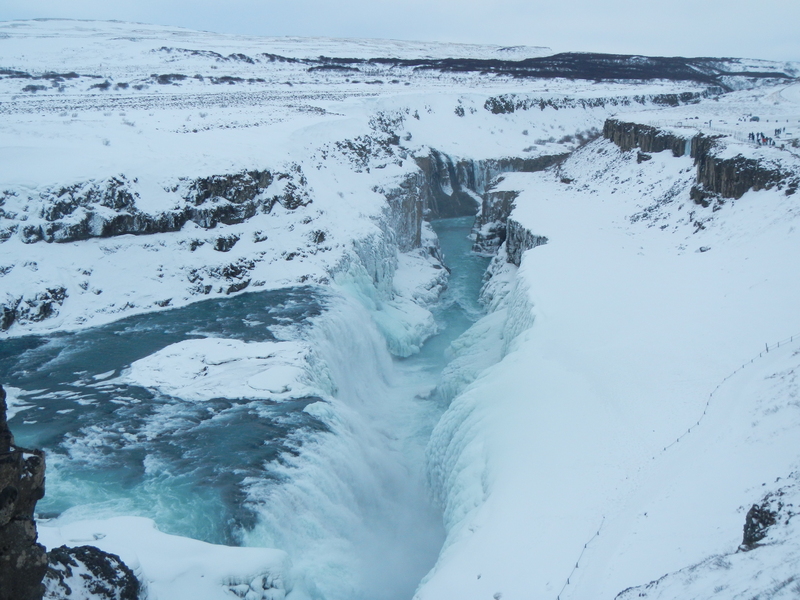 The waterfall at Gullfoss flows throughout winter, but you can see where the spray has frozen on the far side. The second day we ventured beyond the usual tourist routes. Hiking through a mountain path on locals’ advice, we eventually reached a river that ran warm in the middle of winter. Further upstream, we found hot springs that were just bearable to hop into and relax after the uphill hike. Top tips: always check how hot the water is before getting in, look out for any signs of temperature changes (or imminent geyser activity!) and make sure you can get out again! 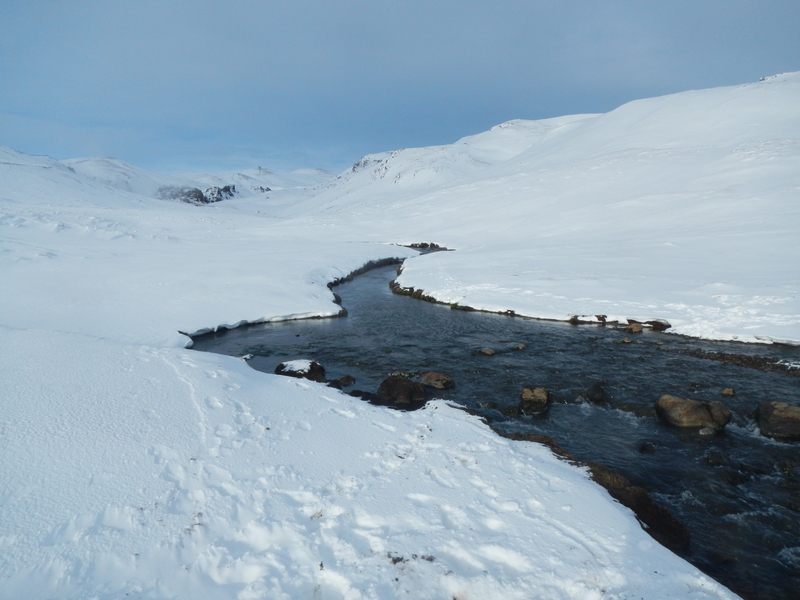 A warm river surrounded by snow. Other highlights included driving through mountain roads and getting stuck in deep snow, then having to dig ourselves out with our hands (NOT recommended!) 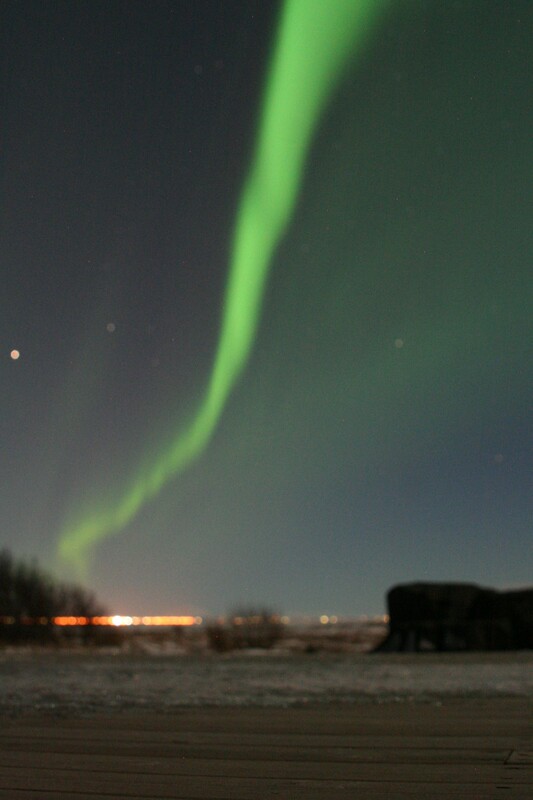 and getting up close with Hekla. You may not have heard of this mountain, but this could be the next big one to erupt, and when it does it may make international news. 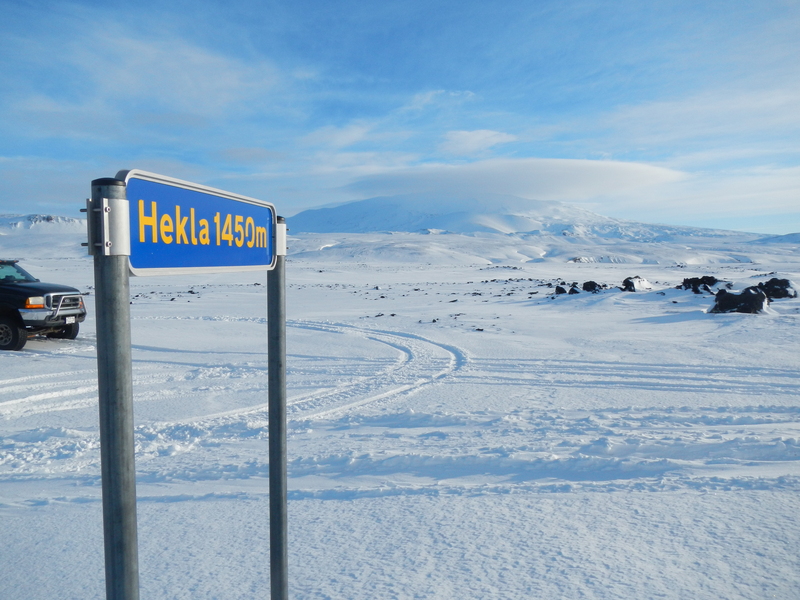 Hekla from a distance, with an ominous lenticular cloud on top. The reward for driving on sheet ice and through deep snow – sights such as waterfalls when you don’t expect them! View of a waterfall taken from behind, just before sunset, south coast Iceland. There’s so much more I could say about my trip to Iceland, so many photos of spectacular sunsets, of epic whiteouts (imagine the inside of a ping pong ball), of more mountains, waterfalls and geysers, but I am at risk of turning this post into a holiday blog. Spending a week there in winter, I feel that I’ve just skimmed the surface of what the country has to offer. It took me almost three years from when I was invited to the Icelandic Embassy in London for a chat about adventure tourism to actually get out there, but now that I’ve been, I’m already planning a return in 2016, possibly to do the OMM Iceland or even the Fire & Ice Ultra.